Streamline Detailing has been serving Minnesota since 1998. Throughout the years, Streamline has expanded nationwide. With our base locations throughout the U.S., we have crews ready for all of your aircraft cleaning needs. 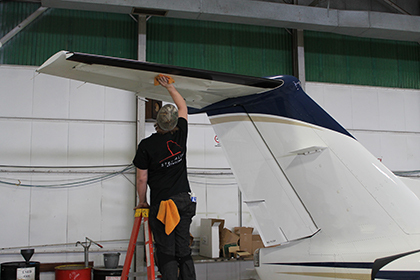 Streamline Detailing specializes in aircraft cleaning for private owners and corporations. We offer complete interior and exterior detailing services for all types of aircraft from small single engines to large turbine engine aircraft. We use only the finest aircraft approved cleaning products. Those products, along with our expert techniques will have your aircraft looking its absolute best. Safety and professionalism go hand in hand at Streamline Detailing. Streamline Detailing employees take part in safety classes such as S.I.D.A and NATA Safety First programs. All employees take part in pre-employment and random drug tests through the FAA programs. In addition, all employees undergo lift training and in house training on a regular basis. Safety is our highest priority. Streamline Detailing is fully licensed and insured. Streamline Detailing takes aviation security seriously. We have made the following security procedures mandatory for all employees to ensure the protection of your aircraft and facility. At Streamline Detailing, we pride ourselves on our quality employees. Click here to meet our team.